Impromptu learning activities are the best…especially when they are initiated by Joe. “Mommy, can we do a craft?” asked Joe after breakfast. 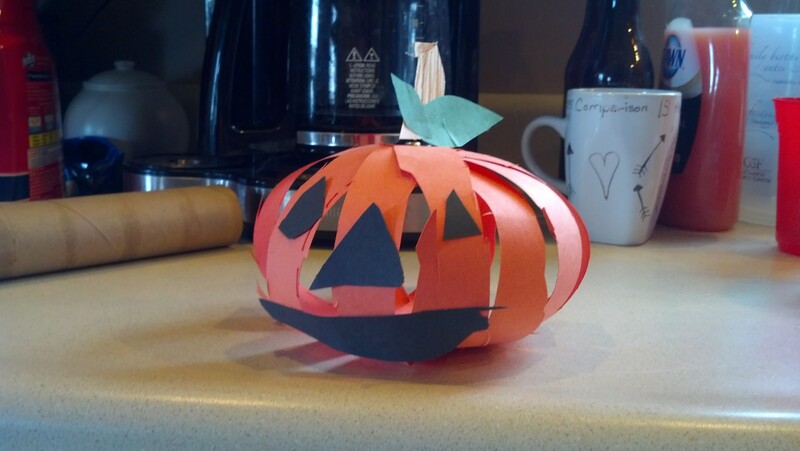 Luckily, I had a few Halloween crafts in my list and educational ones to boot. All three crafts we completed involved the use of scissors with one focusing on numbers and matching. 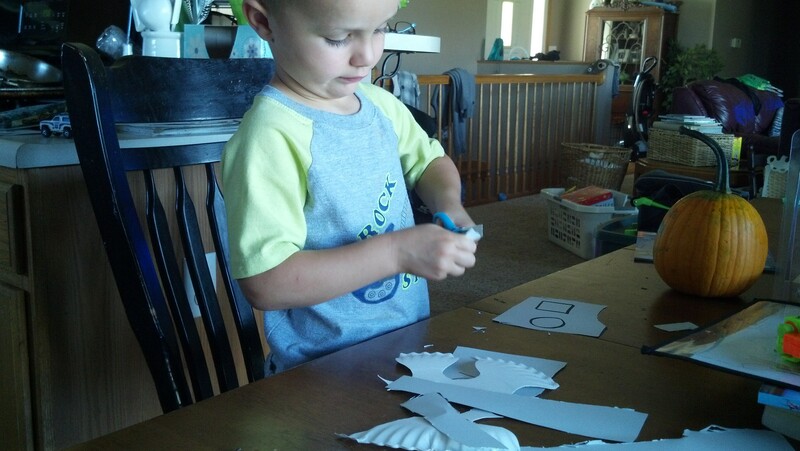 First up was a “Read and Make” craft from notimeforflashcards.com. Since we already had the book In the Haunted House, it was easy. First, we read the book twice (at Joe’s request). Then, while I drew a haunted house and cut out ghosts, Joe did his as well. He was quite proud of his ghosts and house and I was proud that he was able to write his name. 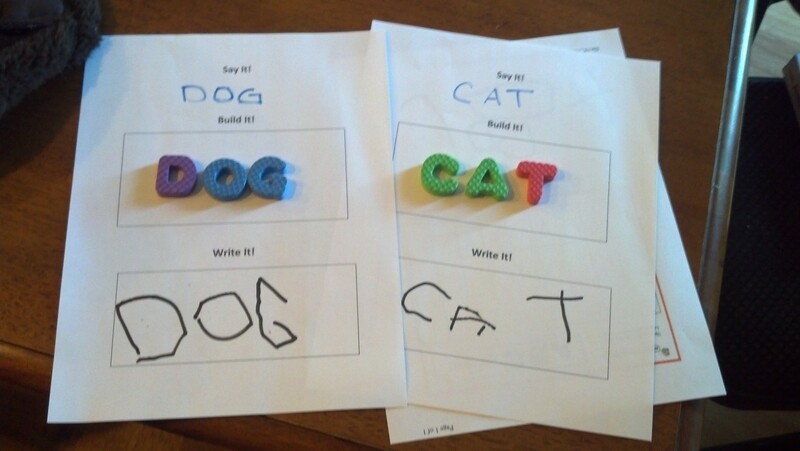 He’s really doing a great job writing letters. I think all that tracing has really paid off. After we were all done with our drawings, we worked on matching the numbers on the ghosts to the numbers on the house. I was surprised at how quickly he was able to stick them on in the right spots. I think next time, I will draw little dots for him to count and match. Next up was a fun cotton ball ghost craft. I drew several shapes for Joe to cut out while I prepared the ghost. He is getting to be quite the master with those scissors. I drew the eyes and mouth and he cut them out. 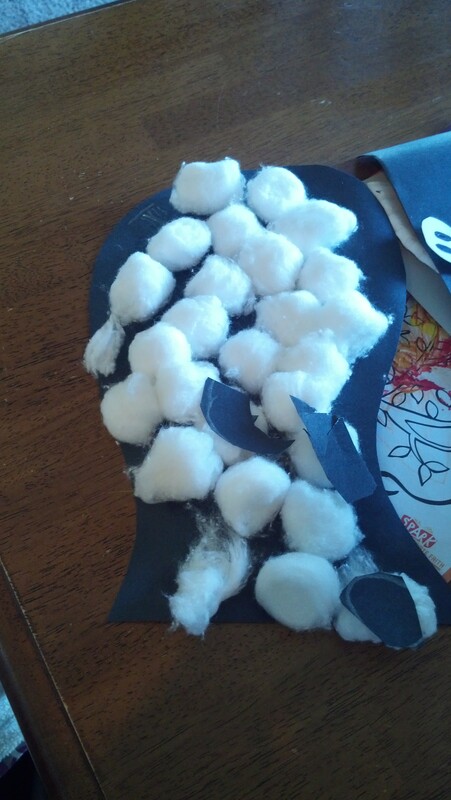 After he glued the cotton balls on I told him to put the eyes and mouth on. Joe’s ghost is moving so fast that its face is a blurr! And then we finished up with another fun craft to increase his skill with the scissors. I drew lines on orange paper and he cut them out as well as the face, stem and pumpkin leaves. Where the site I got this from used tape, I used brads to complete the pumpkin. FUN! This entry was posted in Education, For the Kids, Garden Stories, Writing. Bookmark the permalink.